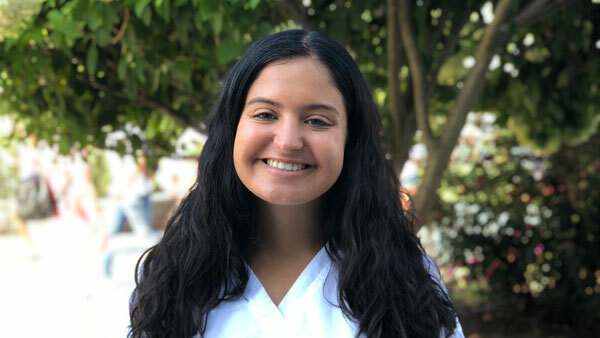 Toni Barbarino, a senior student at the Decker School of Nursing, is a recipient of the 2019 SUNY Chancellor's Award for Student Excellence. Image Credit: Provided. Toni Barbarino, a senior student at the Decker School of Nursing, is a recipient of the 2019 SUNY Chancellor's Award for Student Excellence. Photography: Provided. Binghamton University Decker School of Nursing student Toni Barbarino is a recipient of the SUNY Chancellor’s Award for Student Excellence for 2019. The award recognizes outstanding students who have integrated academic excellence with other aspects of their lives, such as leadership, campus involvement, community service, the arts, athletics or career achievement. Barbarino, a senior from Kings Park, N.Y., is an exceptional student-athlete who balances an often-rigorous workload, splitting her focus into a bevy of pursuits and succeeding in all. I take my role as a nursing student very seriously and give 100 percent to all assignments, tests, simulations and clinical experiences. A member of the Decker School’s Honors Program, Barbarino’s work focuses on the application of touch therapy for infants in neonatal care and for infants experiencing drug withdrawal. In addition, during the summer she was selected for a competitive externship at Northwell Health (only 10 students are chosen), where she gained clinical experience and educated fellow students about the importance of patient advocacy. Barbarino is also a Binghamton University Scholar. She is completing a health and wellness studies minor and is a consistent member of the Dean’s List. But, more importantly to her, she is widely involved both on and off campus. “Being a college student entails becoming a good teammate, getting involved in research and campus organizations, as well as giving back to the community,” she said. During her four years at Binghamton, Barbarino has devoted herself to the Binghamton University Cheer Team, and is now a captain of the group. Since 2017, she has served as president of Binghamton’s March of Dimes chapter, coordinating fundraising events that support and raise awareness for premature infants. Additionally, Barbarino is a cycling instructor for the University’s Campus Recreation Services. “To me, winning the Chancellor’s Award means that my hard work and dedication in every aspect of my college experience has paid off. Late nights in the library, early morning clinicals, long weekends spent cheering on the Binghamton basketball teams and practicing with my cheerleading team, and hours spent planning fundraisers for the March of Dimes have been completely worth it and have not gone unrecognized,” Barbarino said. “This award shows how being a college student means more than just being a student, which is obviously an important part. I take my role as a nursing student very seriously and give 100 percent to all assignments, tests, simulations and clinical experiences. It is a true honor to have even been recognized by the Decker School of Nursing and Binghamton University, but it is an even more amazing honor that the SUNY Selection Committee has recognized this hard work as well. “I am very proud to represent Binghamton University and the Decker School of Nursing with this award,” she added. Barbarino expects to graduate in May and intends to work on a pediatric or pediatric intensive care unit. She will receive her award at the Chancellor’s Awards ceremony April 24 in Albany, N.Y.